Hidden under every mushroom, invisible to the naked eye, thousands of spores fall and are blown away by the tiniest current of wind. 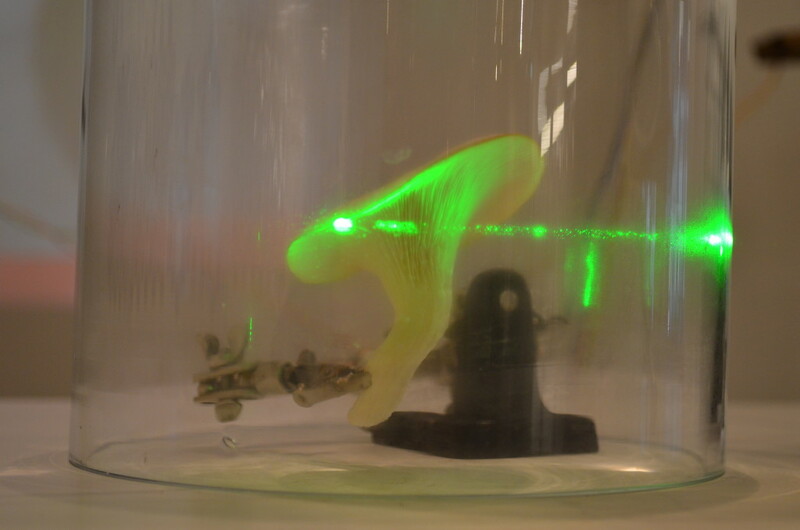 Shining a laser underneath a protected mushroom makes these spores visible. It looks gorgeous. I worked with mycologist Patrick Hickey to create a musical installation out of these spores. Using custom built software and hardware, we made a system that reacted in real time to make sounds to represent the natural processes inherent in the mushroom. The installation has been shown at Inspace in Edinburgh, The Arches in Glasgow, and Mediamatic in Amsterdam. At Inspace we put together a “Secret Sounds of Spores Spectacular”, where free jazz trio The Dyad improvised along with the installation is what was probably the world’s first human-fungi musical collaboration. This project was supported by an Alt-w award from New Media Scotland. The distribution of Alt-w awards is managed by New Media Scotland and funded by Scottish Screen, Scottish Arts Council and SICSA.